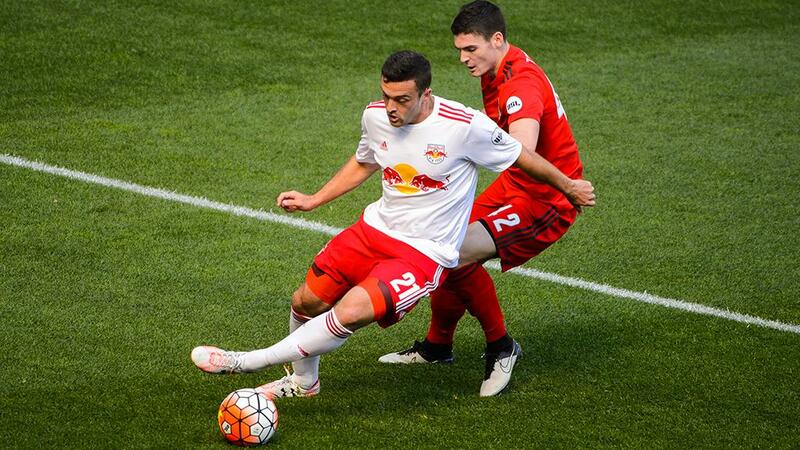 HARRISON, N.J. – Brandon Allen scored a pair of second-half goals as the New York Red Bulls II rallied to earn a 2-2 draw with Toronto FC II at Red Bull Arena on Saturday afternoon. Raheem Edwards and Skylar Thomas had given TFC II a two-goal lead before the break, but the Young Reds were unable to hold the lead as New York’s pressure paid off with two goals in four minutes midway through the second stanza. TFC II (0-0-1, 1pts) created the first good opportunity when Edwards battled past two defenders on the left and cut a pass back to the top of the penalty area. Chris Manella had space, but his first-time shot went just over the crossbar. Allen had the first good effort for the Red Bulls II, but his shot from 15 yards was comfortably saved by Toronto goalkeeper Alex Bono. Sean Davis was also denied as Bono got down well to save as New York began to take the upper hand in the opening 20 minutes. The Red Bulls II (0-0-1, 1pts) continued to have the better of possession, and Stefano Bonomo almost benefited as a good move down the right as he created space in the penalty area off a low cross only for Bono to be well-positioned to save. Bonomo also went close a few minutes later when a well-weighted pass by Derrick Etienne slid Bonomo through. He forced the ball past the advancing Bono, but the goalkeeper got just enough of the ball to hold it up and allow the defense to recover. Toronto took the lead against the run of play as a slick passing move that saw Sal Bernal release Mo Babouli in behind the Red Bulls II defense. His low, driven cross found Edwards for a simple finish at the back post 10 minutes before the break. Their confidence clearly boosted, the Young Reds doubled the lead in stoppage time as a chipped ball back into the penalty area found Skylar Thomas, up for a prior corner kick, who applied a deft first-time finish to make it 2-0. New York’s Sean Davis, who was positive throughout, forced a save from Bono with a free kick seven minutes into the second half as the Red Bulls II tried to get back into the game. Toronto looked to hit on the counter-attack, and almost made it three as Edwards broke forward on the left and sent a pass through to Bernal, but his finish spun wide of the left post as Red Bulls II goalkeeper Ryan Meara narrowed the angle. New York got back into the game with 25 minutes to go when Etienne was pulled down in the penalty area, resulting in a penalty kick. Allen has his initial effort saved by Bono, but put away the rebound to halve Toronto’s lead. Four minutes later, Allen struck again as he found a pocket of space which allowed Davis to slide a perfect pass into his feet that allowed him to turn and send a low shot from the right side of the penalty home at the near post. Allen almost completed his hat trick in the 74th minute after his shot was saved following a block of a shot by Vincent Bezecourt. Toronto also went close to regaining the lead as Meara was forced to make a big save to keep TFC II’s Edwards from finishing after a driving run into the left side of the penalty area with 10 minutes to go. As Toronto sat back late, New York tried to pick a way through for a late winner, but honors ended even as the visitors held out for a point. New York will hit the road for its next contest as it visits Louisville City FC next Saturday at 3 p.m> ET at Louisville Slugger Field. Toronto will next visit FC Montreal on Saturday, April 9 at 7:30 p.m. ET at Stade Olympique.